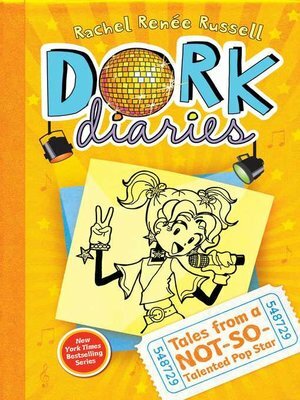 Enhance your Dork Diaries experience with this special eBook edition featuring animated illustrations! Nikki Maxwell has been doing everything she can to keep everyone at school from learning the truth—that she's there on scholarship in exchange for her Dad working as the school's exterminator. The last thing Nikki needs is having her friends and—worst case scenario—her crush, Brandon, associating her with the humongous roach on top of her Dad's van! Now it looks like her secret could be about to come out, and Nikki's willing to go to any zany and wacky length to prevent that from happening. The timing seems perfect when a major talent competition is announced with a school scholarship offered as the top prize. Nikki loves to sing and dance and now she gets to have tons of fun with her friends while competing for a chance to free her Dad from his obligation! (And free herself from all that potential damage to her reputation . . .) Once again, hijinks and misunderstandings aplenty ensue, as well as more hilarious and heartwarming moments with Nikki and her friends. This special animated e-book brings several of Nikki's illustrations to life! Rachel Renée Russell is an attorney who prefers writing tween books to legal briefs. (Mainly because books are a lot more fun and pajamas and bunny slippers aren?t allowed in court.) Rachel lives in Chantilly, Virginia.